1000s of Quality Vintage Design Resources 95% Off! Add the vintage aesthetic to your design work, using these best selling, world class resources. 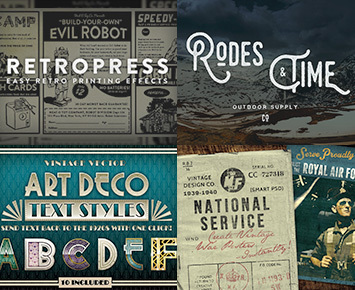 We’ve teamed up with the top vintage designers in the world to bring you a range of effects packs, textures, brushes, fonts and more, to help you to create beautiful, authentic looking retro designs. One of the key reasons why vintage design is so sought after is because it’s perceived as difficult to recreate. With so many retro designs out there, it is the subtle touches that make your piece feel authentic. It’s these details that make the difference between a credible design and a vintage knock-off. The world’s biggest design agencies have no big secret when producing truly authentic-looking vintage designs. They simply work with the right tools, and this bundle brings you exactly that! We’ve teamed up with the biggest names in the vintage design world. Our friends at Retro Supply Co, Vintage Design Co, 2 Lil Owls and more set the standard when it comes to authentic, quality vintage design resources. This bundle brings you their finest work, at an incredible 95% discount. The resources in this bundle are so easy to use they’re practically plug and play, while being robust, authentic and well-crafted. This means that you’ll be able to create some seriously convincing vintage designs. These tools are the result of hundreds of hours of work, ensuring every detail is perfect. Design materials have been meticulously sourced, scanned and captured, bringing you everything from real World War I-II documents, to beautiful Victorian lettering. All of these hours of careful work, incredibly rare source materials and laborious, precise processing is now available within this exclusive collection. This is your opportunity to create world class vintage effects with total ease. You can own over $600 worth of these industry leading products, for a massive 95% off. This bundle also includes our extended license, making it even more valuable for you. You’re able to use these resources in wider, original designs available for resale, as well as personal and commercial projects (full deals further down this page). Give Your Photos that Vintage Film Look in One Click! • 30+ RetroLab presets give you stunning effects fast. • RetroLab Quick and Easy Tutorial Videos. • 20 RetroLab film actions. • 22 Seamless surface actions. • 10 Realistic light leak actions. • 8 Camera flash and hot spot effect actions. • 4 Film grain actions. • 60+ Seamless surface textures. • 4 coffee stain brushes. • 5 real frames including: Polaroid, classic photo, film negative and burnt photo. • Need low resolution seamless patterns? We’ve included over 15! The same kind of kit used by your favorite design studio. It’s well known that design studios have collections of resources created in-house. These resources save tons of time. RetroLab is a powerful kit you’ll use regularly in your work. Say Hello to RetroPress – Photoshop Action Set! • Ink Viscosity – Ink soaks into paper and spreads based on how thick it is. That’s called viscosity and it’s essential to getting a realistic print effect. RetroPress gives you three viscosity actions (light, medium, and heavy). • Roughness – Look at a printed newspaper or magazine from circa 1950 really close. You’ll see the edges of the ink aren’t smooth but have a slightly rough edge. This subtle touch is often missed when designers try to create a retro print effect. RetroPress includes 3 roughness settings. • Ink Texture – When ink soaks into paper it flows over the small paper fibers and pools in between. This creates a subtle texture. With RetroPress you get an easy to use action that let’s you adjust the intensity as you see fit. • Halftone – Back in the day you’d find halftone printing everywhere (images created from small dots). RetroPress gives you an authentic halftone effect in black ink and color. Note: RetroPress was designed to create a retro newsprint effect. It’s recommended that you use it on one colour artwork. Results will vary on multicoloured artwork. If you’ve been waiting for the right kit for illustrator text effects, you don’t have to wait any longer. RetroType gives you a collection of authentic text styles that you can apply to your designs quick and easy. Get All The Most Popular Atomic Age Print Effects Without Leaving a Single PSD File. 7 high-resolution halftone brushes (average size is 1200 pixel radius) that make it easy to add halftone textures to your work even if you’re not using the Atomic Age Print Pack. Halftone textures were taken from large areas of gray in vintage newspapers. Unlucky is a pessimistic style blackletter script. It includes lovely retro flourishes, as well as a bold and clean aesthetic. Unlucky is really versatile, and perfect for your more retro style designs. Chalk Brushes for Illustrator Inspired by Early 20th Century Drygoods Stores. The DryGoods – Chalk Brushes for Illustrator Pack is a throwback to these stores. The DryGoods set equips you with 23 chalk Illustrator brushes. These brushes were created by using a variety of different chalks. Each with different amounts of wear and tear (for maximum diversity in your work. Finally, we scanned them in at 600 PPI, post processed the scans in Photoshop, used premium auto trace software to convert to vector, and then minimized as many points as possible. The result is a set of chalk brushes that look extremely real. Even though they’re vector (as you can see from the examples) they look just like real chalk! Note: These chalk brushes were made using our 5-Step-Vectorization Method. The result is extremely realistic chalk brushes, so real, they’re hard to tell from the real thing! Monthoers is handmade vintage, textured display typeface, combining the style of classic typography with a modern hand-lettering style. SwiftType’s main function is to convert your pen & ink hand lettering scans or vector text into beautiful type over photo artworks. Also including textures, light leaks, filters and photos in well organized folders, you’ll have everything you need in one Photoshop document to quickly and easily create retro Instagram inspired art in seconds! • Scan Lettering: Transform your pen & ink lettering scan instantly into a work of art. 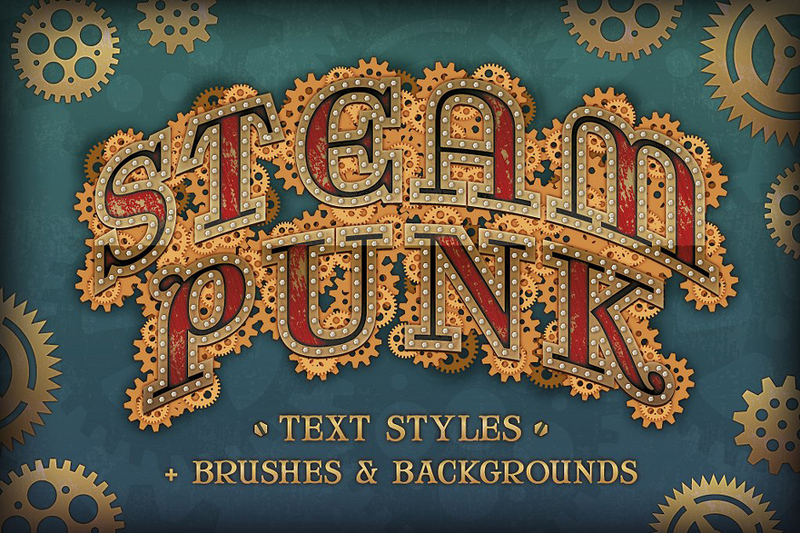 • Vector Lettering: Give vintage print effects to your vector / text artwork. 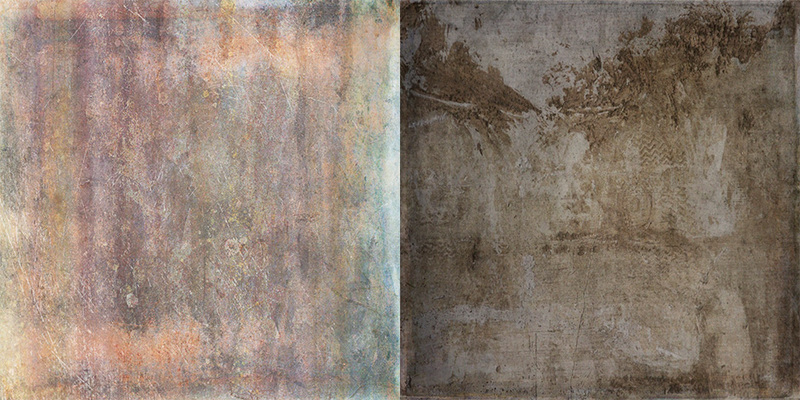 • Textures – add an aged and worn look to the photos. • Photos – choose from a stunning library of photos to use behind your lettering. • OneClick – reverse your type so photos show through it, instead of behind it. After the much successful PosterPress – Vintage Travel Posters, I set out to make a product to recreate the stunning poster art of the 1st & 2nd World Wars. With National Service PSD you get instant paint effects to any photo and also vintage print effects to your type. I’ve also included an exact replicate of a ration book with fully customisable text with the same effects applied to type as the main PSD. You also get 20 handmade print textures that ages and distresses the posters but also 10 textures taken from actual World War memorabilia such as letters, books, leaflets and documentation. Plus I’ve research the typography of the era and produced 4 pages worth of free fonts and where to download them categorised into their different styles. Thanks to Sam Jones for his expert help in engineering the paint effects to the photos. Software compatibility: Adobe Photoshop and Illustrator 8. Full editing of the source files requires a vector application such as Adobe Illustrator, CorelDRAW or Inkscape. You can also open each texture with a transparent background at any resolution required (rasterizing) in an image application such as Adobe Photoshop. Note from Design Cuts: We’ve teamed up with Denise at 2 Lil Owls to bring you 6 entirely new collections of her world class textures. 2 Lil Owls set the standard when it comes to texture art, and the brand new packs are no exception. 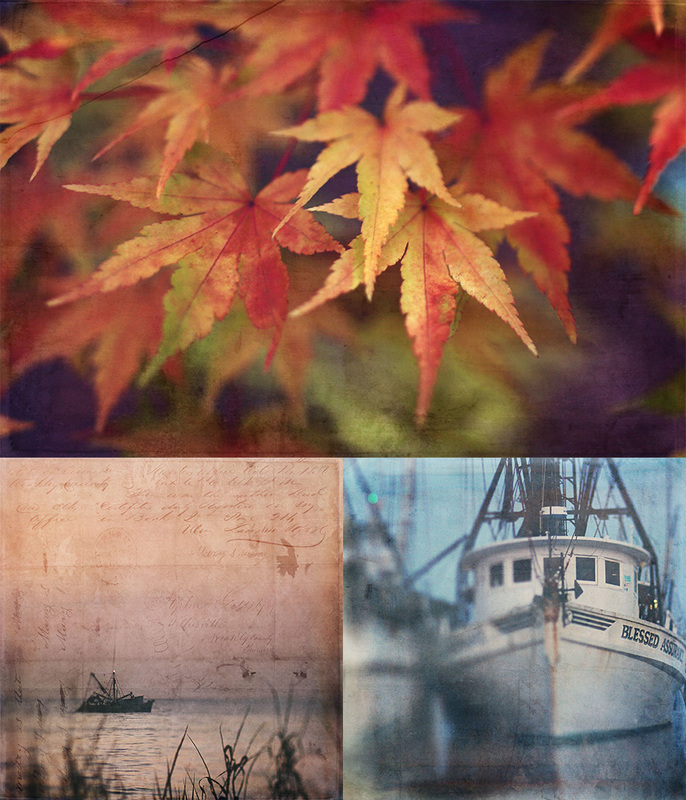 The textures I create are made with tons of layers and I want each and every one to be a little piece of art so that when you combine them with your design work or photography – you end up with something really unique. This collection is the perfect blend of vintage elements including old papers, vintage writings, and glorious grunge. These are so beautiful they are sure to be part of your go-to collection for every project! Software compatibility: JPG files work with any graphic software. Introducing Höchstadt – A multi-lingual typeface with 4 styles. Inspired by old whiskey labels, Höchstadt is a must have in your type collection. Its industrial feel & multiple styles of serif & sans serif with oblique options give you a wide range of use cases for branding, bold web typography, advertising & apparel design. If you’re looking for a bold, clean, industrial typeface with personality, Höchstadt is for you. This is a multi use typeface, that you’ll use in various ways for the years to come. •	The easy-to-use Play All action to speed up your process. Aesthetique is a Victorian typeface, featuring decorative initials. It is perfect for old time, rural, ancient and vintage design work. Each letter has been handcrafted to give an authentically olden appearance. Edmond is new typeface from Decade Type Foundry. It’s hand-lettered aesthetic adds an organic, authentic touch to your work. Edmond is perfect for print and logo work, as well as more vintage themed digital designs. 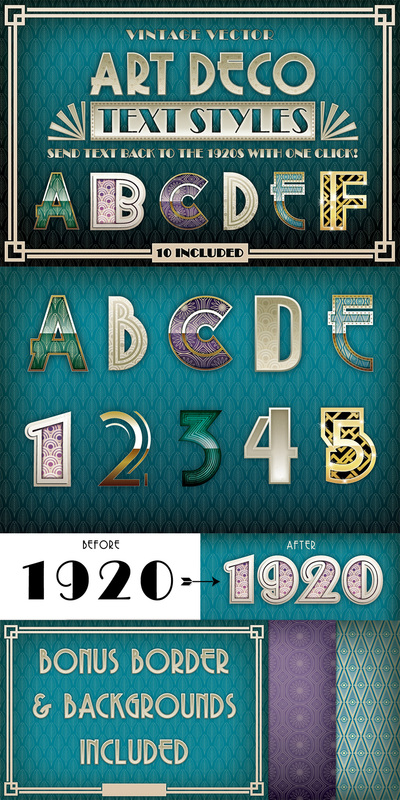 Fully editable vector backgrounds and frames inspired by the classic American Speakeasy. Inspired by the American prohibition era, with the bright lights of Atlantic City and the bars and dance clubs, this collection of backgrounds and frames is the perfect template for creating your own vintage 1920s themed designs. Taking design elements from classic seafront signage, fairgrounds, jazz clubs and gambling dens, these six designs offer easy to use templates that can be adapted for stylish menus, New Years party invites and maybe even an art deco inspired wedding. Supplied in a wide variety of editable file formats including vector Ai and Eps, Layered Photoshop Psd and high-resolution Jpgs, you’ll easily find a version that works for you. All text-paths and effects are pre-set, so all you need to do click and edit! The vector versions offer full editing capabilities so you can even take the individual elements and create your own designs from scratch. Each design is also supplied in two versions. The first features all light-bulbs fully lit, and the second offers a more weathered look with the occasional bulb blown out. All fonts used are listed in the enclosed help file and are all freely available on Google Fonts. Software compatibility: Adobe Photoshop and Illustrator CS1 and newer. JPG and PNG files work with any graphic software. Head back to the boardwalk, with these fully editable logos and signs inspired by American prohibition era! Inspired by the exploits of our favourite gangsters and bootleggers from Atlantic City, these prohibition era boardwalk signs capture the thrills and spills of the 1920s Jazz age and secretive speakeasies. Boasting 12 individual designs taking elements from fairgrounds, nightclubs and dance halls, these offer the perfect tools for the creation of your own vintage party or hootenanny. Supplied in a wide variety of editable file formats including vector Ai and Eps, Layered Photoshop Psd, high-resolution transparent Pngs, and flattened Jpgs, you’ll easily find a version that works for you. All text-paths and effects are pre-set, so all you need to do click and edit! The vector versions offer full editing capabilities so you can even take the individual elements and create your own designs from scratch. Let that inner gangster run free with Wing’s Prohibition Era Boardwalk Signs! 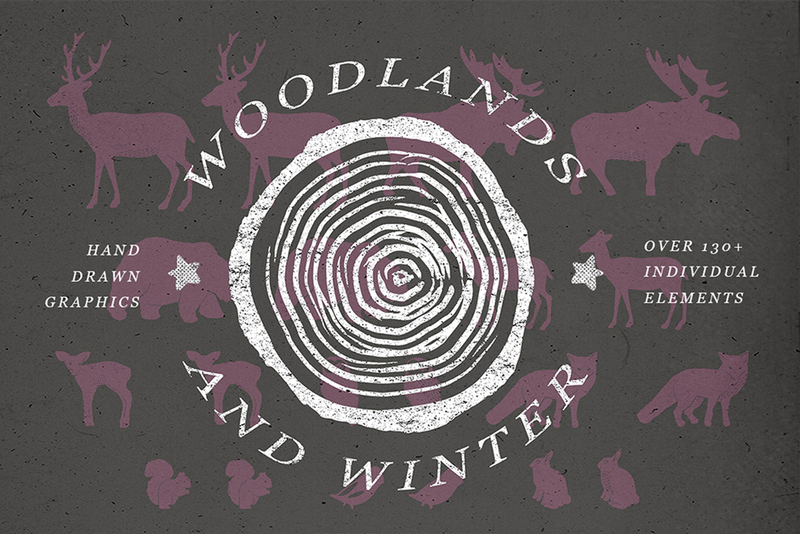 A beautiful collection of 33 vector hand-drawn, vintage-style, filigree ornaments. Every swirl was carefully drawn in Illustrator. These ornaments are perfect for projects such as wallpaper and patterns designs, interior design elements, fabrics, cards, scrapbooking and many more. Software compatibility: Adobe Photoshop and Illustrator CS2 and newer. JPG and PNG files work with any graphic software. A huge set of 66 gorgeous hand-drawn, vintage-style, engraved ornaments. All graphics were carefully drawn in Illustrator. Layer styles allow you to quickly change the look of text and objects with just one click. Because these are in vector format they can be enlarged almost infinitely without loss of resolution. •	An Illustrator EPS containing all 10 styles. Save hours of work and research and create your own Daguerreotype Photo in just a few steps! This set comes with 20 high resolution Daguerreotype Textures, and 4 Photoshop Actions to help you achieve that truly original Daguerreotype look. Software compatibility: Adobe Photoshop CS5.5 and newer. The Main textures work with any graphic software. This set contains 66 vectorized, vintage engravings of various flowers. It’s all vector so you can easily change color, or scale it to any size you need. These illustrations will be perfect for any florist, beauty or gardening related designs, flower shop logos, wedding stationery, greeting cards, retro emblems and badges etc. It’s also very suitable for decoupage and scrapbooking purposes. Software compatibility: Adobe Photoshop and Illustrator 10 and newer. Retro ad templates made in the style of 1950s print ads, featuring original illustrations and our “Automatic Texturizer” photoshop effect preset, and bonus textures. 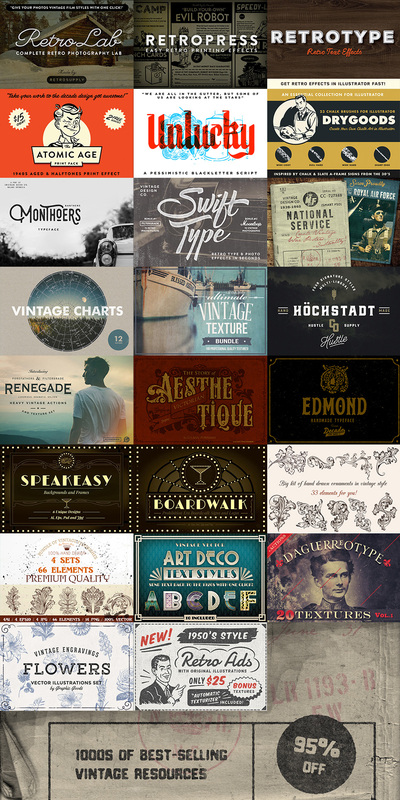 •	17 vintage ad templates (including the cover). Each ad is a very high resolution, layered PSD file with fully editable text paths. Minimum size for an ad with a figure is 6000 x 4200 px, without figure is 4800 x 2550. •	Only free fonts are used and a list of fonts used with download links is included. •	Automatic Texturizer Photoshop effect preset that gives your work a vintage newsprint look. Easily apply and adjust desired amount of texture. •	66 very hi-res PNG files of all elements with transparent backgrounds. Software compatibility: Adobe Photoshop CS3 and newer. PNG files work with any graphic software. This deal includes thousands of gorgeous vintage resources from 14 best-selling designers, including: effects packs, textures, floral graphics, flourishes, retro templates, fonts, vectors and much more! All files are well organized in neat, labelled folders and sub-folders. This bundle is focused on best selling and already incredibly popular items. This is an exclusive chance to own this collection of handmade resources for this kind of price. File size is approx 6.26GB unzipped (split into 16 smaller parts) for easier download. A single download option is also available. A .pdf guide and image gallery have also been provided for easy browsing of your download parts and overall bundle. I don’t know how to use “DryGoods – Chalk Brushes for Ai”. more precisely: I don’t know how to apply this brushes to fill type. Thanks so much for your comment and I am really sorry that you are having trouble with this! I’ve also am just taking Sebastian’s course and saw your complete vintage designers kit in one of his videos. This set is so perfect for both my photoshop work and my mixed media work. Any way I can still get this???? Thank you so much for getting in touch. I am really sorry but I’m afraid that this deal is now well and truly finished, so I won’t be able to set you up with this. We have recently launched our new marketplace and with this in place, we will no longer be featuring our older bundles as re-runs in conjunction with our new bundles. I apologise for any inconvenience caused! I hope this helps, Joyce, and I hope you are enjoying Sebastian’s course! If you have any other questions or if there is ever anything else I could assist you with please do get in touch. I’m always happy to help! Of all of the bundles I missed, this is probably the one that hurts the most to have missed. Please let me know when this deal comes back. Would love to do something like this for a church meeting announcement. Thanks so much for commenting on this one, I am so sorry I can’t help you out with this- as this is one of our older bundles it expired some time ago. However, if there were any items in particular that you are after from this bundle you may be able to get them in our new marketplace! If you don’t see the item in our marketplace that you are looking for, please do let me know and I can work on adding that for you. Hopefully something in our marketplace will be able to help you with your church project :). I have just seen your ‘expired’ offer for Design Cuts bundle. I have just finished Sebastian Michaels’ Black and White Photo Artistry Course and am starting the Photo Artistry and Awake courses. I am so disappointed to have missed out on the deal. Will there be another opportunity? I know this is probably not in your plans now, but thought I’d ask! Thanks for the comment on this one! This bundle is actually one of our older deals and it’s unlikely that we’ll be offering it again. I am really sorry about this, however, we always offer new bundles every two weeks and I’m sure we will have another similar bundle again soon! You may have seen that we have launched our own Marketplace as well last week- this will allow you to grab some of the most popular products from past bundles as a kind of second chance if you missed them the first time around. So if there was a particular item you were after from The Complete Vintage Designer’s Kit, you may be able to grab it in our marketplace 🙂 If you don’t see the items you’re after in the marketplace, please do let me know and I can work on getting them added there soon! I hope this helps, Jacqui, and please don’t hesitate to contact me should you have any other questions. I’m always happy to help! I am also sad to have missed out on this wonderful deal! I would love to be added to the master list so I can purchase it at the next run. Thank you! Thanks for contacting us about this one and rest assured I have popped you onto the master list for this one so if this one comes around again, I will definitely be in touch :). I just recently signed up for Sebastian Michaels class and am going through the initial modules and came across this site through a link. Sadly, the deal has ended. Can you please keep me in the loop for any additional deals you may have in the future. This deal looked AMAZING! So many choices to create art! I would love to have these products to use. Thank you so much for your comment! I hope you are enjoying Sebastian’s course 🙂 I can certainly keep you updated on our future bundles. The best way to ensure that you don’t miss a deal is to join our free newsletter, by signing up at http://www.designcuts.com. I have also added you to the master list for this bundle and I’ll be sure to drop you an email should it become live again. Thank you so much for your kind words about the Complete Vintage Designer’s Kit! Whilst it is currently expired, if there are any particular items in this bundle you were interested in, please do let me know which ones they are, and I’d be happy to point you towards the designers stores, where you can purchase them individually. Any way to get it, even if with another bundle .. Please let me know if you rerun or do anything vintage – I’ll be there!!. Just bought the mockup template – fantastic, this will help me no end. I’m a big DC fan already (spreading the word!!). Thanks for the comment and thanks for your purchase of our mock up bundle- I hope you get loads of use out of it! I am so sorry that you missed out on our vintage kit though- I have added you to the master list for this one Phil and if it goes live again, i will definitely be in touch! Are there any particular vintage resources you are after for projects that I could look at trying to source for you? Please do let me know- I am always happy to help :). Oh, sorry to have missed this one :((. Please let me know if you do a re-run! I hope it helps! Speak soon! +1, add me to that list of peeps who really, really want to buy this deal. Clicked here from my email to purchase and it had already expired 🙁 Any way to resurrect it, would be so grateful! Man, I saw this in my email then totally forgot to purchase this. Will you be offering this deal again? Or is there a way I can get this same deal again? This looks like an awesome deal and I don’t want to miss it again. I hope this helps, and please don’t hesitate to contact me should you have any questions. I’m here to help! Sorry I missed out on the complete vintage kit. Was busy replacing my iMac ( wipes tear from eye). So money was tight when it came around. Could you please let me know if this will be repeated again anytime in the future. It was such a good deal and I am truly gutted I missed it. Thanks so much for getting in touch, I’m really sorry to hear you missed the Complete Vintage Designer’s Kit! Not to worry, I have sent you a quick email to assist you with this, I hope it helps! I hope your new computer is treating you well, speak soon! OK, add me to the list of ones who really meant to buy this deal. Got a return email from Carol yesterday (11-17) and really didn’t realize it expired. Went here to purchase it and its gone 🙁 if you can spare another email link I would be so grateful. Thank you for getting in touch! I’m really sorry to hear that you missed out on this bundle! I would like to know how I can do to acquire this Deal I would like to buy or know when it comes out something similar or the same products as they could not buy it. Thank you. I hope it helps! If there is ever anything I could assist you with please do get in touch. I’m always here to lend a hand. Ugh! I have had this window buried in my browser and just ran across it while work was calm enough to clean up my digital office. So mad at myself for not jumping on this one when it was up. Please let me know if it becomes available again! Thanks for inspiring my design eye to keep exploring! I hope this helps, and thank you so much for your kind words! Please don’t hesitate to contact me should you have any other questions. I’m always happy to help! You are very welcome, Aimee. Absolutely gutted I missed this bundle! I’m not sure how I missed it but I have, darn it! Please will you bob me on the list incase there’s a re-run? Or if there’s any chance you can sneak a link for a returning customer I’d be ever so grateful 😉 I would love love love this bundle. Thanks so much for commenting and I am so sorry that you missed out on this one! I couldnt let you miss out on this one given all the love you have for it so i have popped you over an email which should help! Plllllllease I need this DEAL!! I have popped you over an email about this which should help :). This is by far one of my favorite deals so far! Thank you so much for this awesome comment! What amazing feedback to receive- we are so pleased that you are enjoying this one! Please do feel free to share anything you create using your resources as we would love to see what you are working on Aaron! Is this compatible with Elements ? Thanks so much for commenting on this one and I can definitely help with this. So the great news is that a lot of this bundle should work with elements for you- i have sent you over an email with more detail for you on what should work for you :). I hope this helps, and please don’t hesitate to contact me should you have any other questions. Great collection! Although I barely need the retro stuff I couldn’t help but buying it because of the really nice photo filters and so many textures. It seems to work (at least I get the set of layers that I can select to activate later) but the message pops up every other step of the action and requires an OK-Click which is a bit annoying because you have to click around 20 times. Do you have a solution for this? My PS CS6 is switched to english and the original file is only a reduced background layer. Thank you nevertheless for a great selection! I bought so many handwriting and handlettering fonts from you now that after so many grungy, pixelated retro stylish deals I would love to see some more „clean“ , minimalistic and technical stuff in the future. Thanks for commenting on this one- I am so sorry that you are having an issue working with Your Renegade resources. I have sent you over an email to get some more info about this and rest assured we shall get to the bottom of this for you! Love the Atomic Age halftone bundle and especially the brushes! Thanks for this, it will take some of the worry out of using my rapidly dwindling stock of zip-a-tone. I always look forward to the deals, and while I may not buy every one, the ones I do get are choice! Thanks! Thank you so much for getting in touch with your kind words, I really appreciate you taking the time 🙂 I’m really pleased to hear that your new vintage resources have made a valuable addition to your creative toolkit! Ugh…There goes a week of Starbuck’s, but your deals are too crazy not to purchase, they unlock the imagination and supply resources that would be too costly for any small client’s budget. With these I can help save time and keep the client happy. Thanks for such a lovely comment! I am so sorry that we are impacting on your Starbucks run especially as they are using the festive red cups :). We are so pleased though that you are enjoying your resources and that you are finding them helpful for your client work- this is exactly what we hope for when we release them. We would love to see what you are working on if you would be keen to share! Wow, I love this collection. It was very well put together. After spending money on your birthday, I’m broke!! Gah! I don’t think I can come up with the moolah in 5 days. I wish this were available for 30 days. Maybe you’ll extend???….? Thanks for the comment and the lovely feedback on the bundle! I am so sorry that you are broke after our birthday but i am so pleased to hear you managed to grab some of our birthday re- runs! Whilst we wont be able to extend this for 30 days, rest assured if you do miss out, i can pop you on the master list so that you can hopefully grab it if it is re- run! I hope this helps, and please don’t hesitate to contact me should you have any other questions. Is credit required when any of the design resources are used within personal and commercial projects, as well as items for sale? This is a good question and you dont have to credit anyone on your designs unless you want to! I know some areas of design require the designers to be credited but it is not necessary with our license. Anyone know if these will work with Pixelmator? It does well with PSD files and I’ve imported brushes before, but never filters. Thanks for the help! Thanks for the comment! I am afraid that Pixelmator is not a software that any of us use over here. however I have had a search online for you and i have popped you an email with a tutorial that should help you work with the filters. I would love to hear how you get on with it Missy :). Thanks for commenting and i can certainly help you with this! All of our bundles are covered by our extended license which means you can definitely use them to create items for commercial sale. However you would need to ensure the resources are part of a wider, unique design so unfortunately you would not be allowed to sell a t-shirt with a resource printed on it were you have not made any changes. I have sent you an email with our TOU for our license so that you are aware of what you are able to do! I hope this helps, and please don’t hesitate to contact me should you have any other questions. Will be getting this. BTW, do you happen to know what font is used for the central word ‘FLOWERS’ in the 66 flowers engraving set? I would like to buy and use these designs for my t-shirt for selling. a t-shirt without changing any design and sell them using in my internet shop? Looks a great bundle. Will any/all these resources work with PSE11 or newer? I know PSE 11 will run some actions but I never know what the limitations are. Thanks for the comment and for your interest in this bundle! I have popped you over an email with a bit more info on what should work with PSE for you- I hope this helps, and please don’t hesitate to contact me should you have any other questions. How many GBs is the bundle, so I can plan, what drive to put them on? Thanks for the comment and this is such a good question :). The bundle is 6.26GB and is available in individual links or also a one complete download link. will these work on PS7? Would you mind letting me know if you mean PS CC or Version 7 of Photoshop? if you are working with PS CC then pretty much all of the bundle will work for you barring the items that are Illustrator specific and I have emailed you over the list of these . Thank you for such a fantastic comment! You are totally welcome and we are sending you back our own thanks times infinity for your purchase and continued support :). Please do feel free to share anything you create with us Prathana as we would love to see what you design! Thanks for commenting on this and I am so sorry you are having an issue accessing your bundle. I have popped you over an email to get some more details about this and rest assured, I will get you working with this! Thanks for having me as a part of this amazing deal! So much good retro stuff! For everyone taking advantage of the deal RetroSupply is happy to help you in any way possible. Feel free to contact us via our site! Thanks again to Tom and the team for putting together this great deal! Thanks for the comment and for being a part of this bundle! I know you have made a lot of our community very happy with your items :). We are getting so much love from the community for this one so thank you again for allowing us to feature your fabulous resources! Oops sorry if this was too close for you after the birthday bundles! However we hope you are enjoying this one and will get loads of use out of the resources :). I already commented on the bundle but I wanted to add that it was the 2 Lil Owls textures that really pushed me to purchase it 🙂 Just couldn’t resist them! We love Denise and 2Lil Owls over here- her textures are always magical and these are no exception! I hope you have an amazing time working with these and the rest of your bundle! Wow! Worth it just for the 2LilOwls textures and Daguerreotype textures only! Thanks so much for your comment! We are so happy that you are finding the bundle good value and hopefully the other resources will help you with future projects as well! Please do feel free to share anything you create using your new resources as we would love to see what you design :). Wow thank you so much for this awesome comment! We are so pleased you like this bundle :). We have gotten so much feedback for vintage resources that we thought this would go down a treat with the community! I have just one question when I buy a “bundle”, can it be that some of the things has been in another “bundle” also? … so that I actually are going to buy those two times? 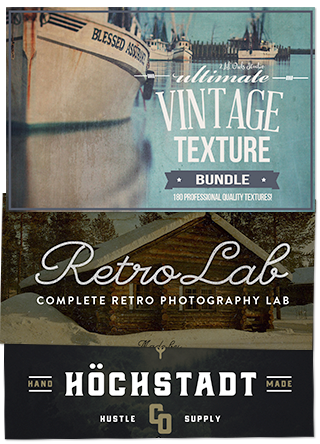 The Ultimate Vintage Texture Bundle – 180 Professional, Quality Textures” , Can this be? Thanks for the comment and this is a really good question! 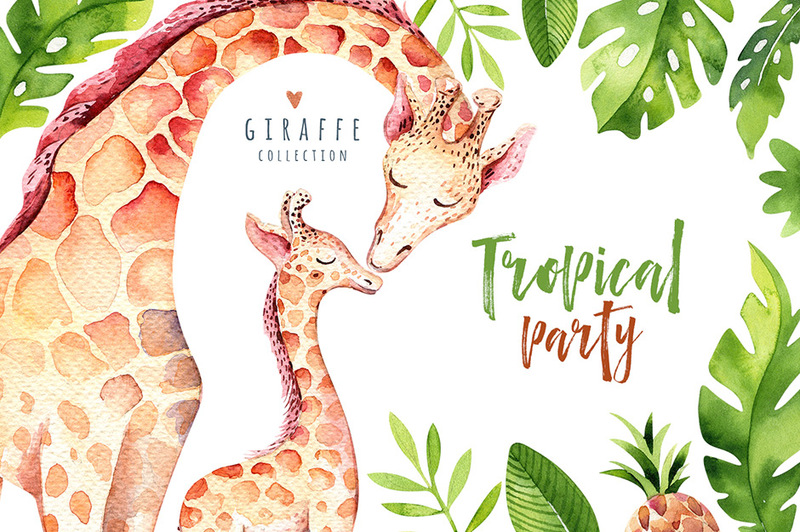 As Denise pointed out her 2LilOwl textures are new and have never been used anywhere else before and I can assure you that all our bundles are comprised of completely new resources, that have never been part of any other Design Cuts bundles in the past. Hi, my name’s Pete and I’m a Design Cuts addict. Rats! When are you guys going to come up with a deal I hate, so I don’t keep spending money? Oh, well, as usual, I love this deal and I’m getting it. Thanks, Design Cuts! Thank you so much for purchasing the Complete Vintage Designer’s Kit and for your kind words, we really appreciate it. I’m afraid that Tom is actually rather proud of his ‘No-Hate-From-Pete’ track record so far! If there is ever anything I can help you with, please do get in touch. I’m always happy to help! That is amazing! Thank you so much for joining us for our birthday celebrations, we had an amazing 2 weeks celebrating with you all! Nice deal ! If only I could get the vintage texture bundle out of this somehow 🙂 I am in love with these textures. Thank you for your comment! It’s great to hear the vintage textures are standing out as a favourite for you. Unfortunately we aren’t able to sell any resources individually as the discount is applying to the bundle as a whole! That is awesome suggestion and one that we are certainly looking to develop in the future 🙂 thanks for taking the time to get in touch, if you had any further suggestions please do let me know, we would love to hear from you! Awesome products! Have any of these items been included in previous bundle(s)? Thanks! Thank you so much for taking the time to get in touch! I’m really pleased you like the look of our new vintage bundle! 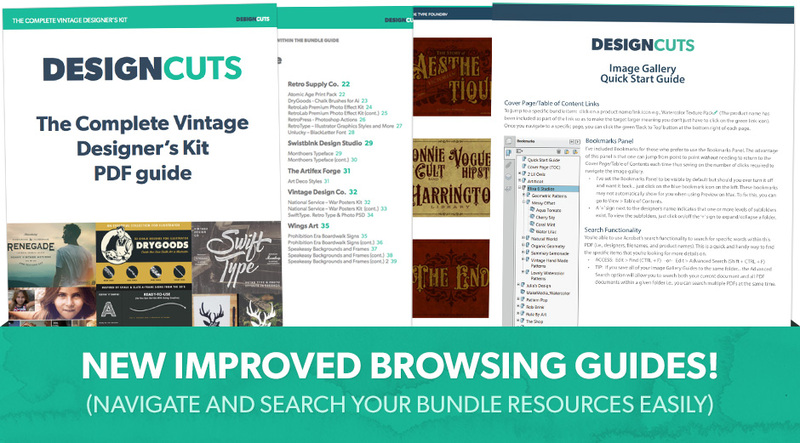 I can assure you that all our bundles are comprised of completely new resources, that have never been part of any other Design Cuts bundles in the past. I hope that helps, and please don’t hesitate to get in touch with me if you have any other questions. I’m always happy to help! I think I’m running out of compliments to give you all! Amazing bundle, one of my top favorites. Thank you kindly for your awesome comments 🙂 we really appreciate your support. I’m so pleased that the Complete Vintage Designer’s Kit has become one of your favourites! Thank you so much for this amazing bundle! This has so many great resources. I can’t wait to use them!